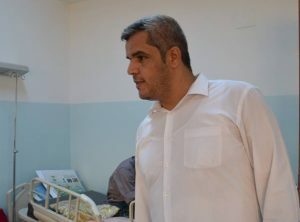 Zliten has become the latest town to damn the Presidency Council’s (PC) ministry of health for failing to honour promises to fund repairs, expansion and new medical equipment at its local hospital. Two weeks ago hospital managers in Ghat despaired of promised money from Tripoli and closed the town’s maternity unit for lack of a paediatrician, adequate power and essential neo-natal equipment. Zliten’s mayor Muftah Hamadi has said that despite his own regular appeals and those of Zliten hospital administrators, no funding has arrived from Tripoli and nor have four promised ambulances along funds to cope with the bodies of migrants washed ashore. Zliten is already involved in ambitious projects which it is seeking to fund from abroad. Now the mayor says his town will raise cash locally to keep its hospital running. Hamadi has told hospital administrators that the municipality will find the money to pay the monthly salaries of up to 20 medical staff to overcome the lack of doctors and nurses. He has also pledged to cover repairs and maintenance to hospital buildings and equipment.